As much as we might love our spouses/boyfriends/roommates/members of the family, ladies, sometimes don’t you just need a space all to yourself? As nice as it might be to dream of having your own wing of the house, or even just a room to yourself, sometimes it’s just not possible. And even if you do have your own den or home office, if you’re living in shared quarters, chances are good that you’ll encounter interruptions from those roommates and loved ones. So what can you do if you really need a quiet retreat but don’t have a ton of extra space? Think of converting a portable building into your backyard sanctuary. There are a lot of uses for portable buildings, but a guest room or addition to your home may not be one that immediately comes to your mind. However, we’ve actually had customers use our portable buildings as an extension their home. One of our customers turned her portable building into a craft room, and another purchased a portable building to use for homeowners association meetings. With a little creativity and some planning, these portable buildings can become your home away from home – in your own backyard. Our buildings come wired for electricity, so you don’t have to worry about not having proper hookups for lighting and cooling. You’ll likely need to purchase a small air conditioning unit or fan to keep your building cool during the warm summer months. Then, start to think about your flooring and paint options. Some bright rugs can really add an impact and nice flair of color inside the small space, and a warm, cheery paint color can really transform the room from portable building to your backyard oasis. After painting is complete (make sure you keep the building’s windows open while the paint dries! ), you can begin selecting furniture. The nice thing about this space is that you can make it just for you, so purchase any furniture you might have previously deemed “not kid-friendly.” Because of the smaller space, lighter colors would probably be best to make the space appear light and airy. Here is a backyard guesthouse, a beautiful garden room (great for afternoon drinks or just a nice place to relax and watch the kids in the yard), and a shabby chic garden shed that’s great for a home office or library (someplace where you need to focus and don’t need a lot of distractions). 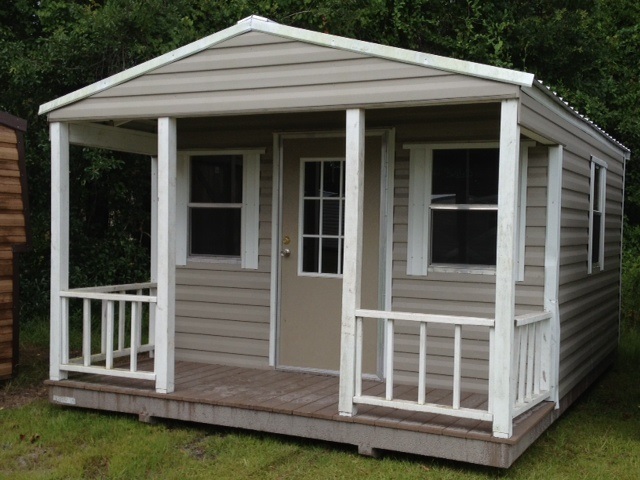 What are some ways you would use a portable building as an addition on your home?